This volume addresses the emergence of multiple legal and law-like arrangements that alter the interaction between states, their delegated agencies, international organizations and non-state actors in international and transnational politics. Political scientists and legal scholars have been addressing the ‘legalization’ of international regimes and international politics, and engaging in interdisciplinary research on the nature, the causes and the effects of the norm driven controls over different areas and dimensions of global governance. 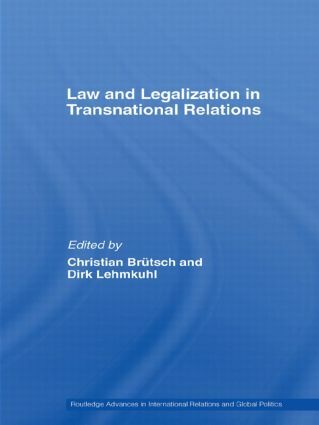 Written by leading contributors in the field, the book claims that the emergence and spread of legal and law-like arrangements contributes to the transformation of world politics, arguing that ‘legalization’ does not only mean that states co-operate in more or less precise, binding and independent regimes, but also that different types of non-state actors can engage in the framing, definition, implementation and enforcement of legal and law-like norms and rules. To capture these diverse observations, the volume provides an interpretative framework that includes the increase in international law-making, the variation of legal and legalized regimes and the differentiation of legal and law-like arrangements. Law and Legalization in Transnational Relations is of interest to students and researchers of international politics, international relations and law.